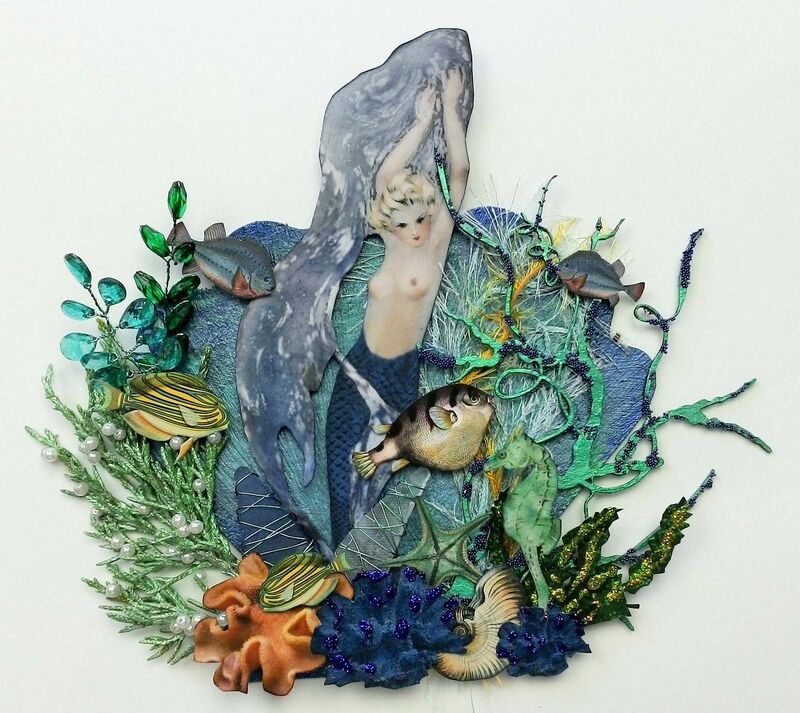 On a warm sunny day down deep in the ocean you’ll find mermaids frolicking in their gardens. 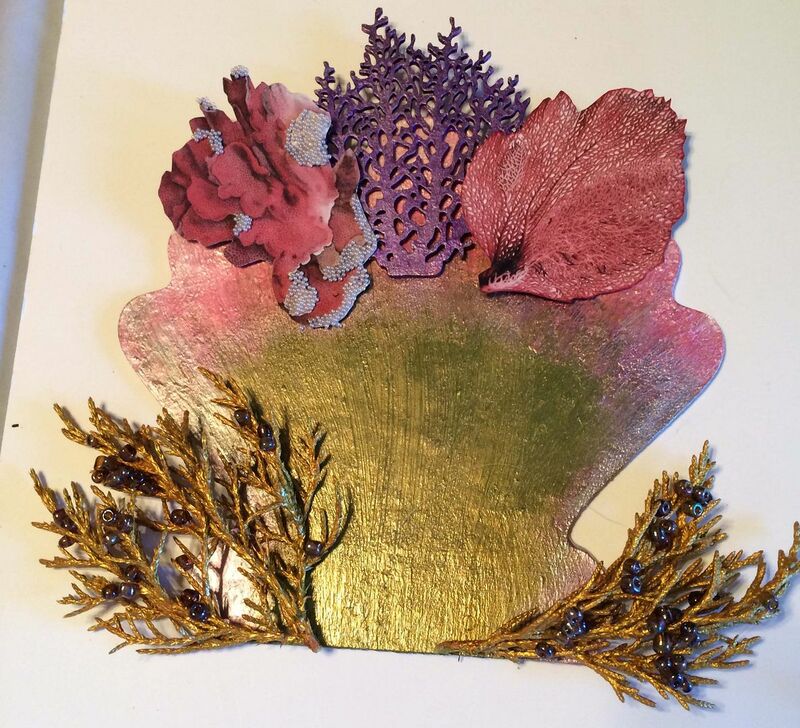 I’ve used all kinds of wonderful sparkly, pearlescent, metallic and iridescent goodies, images from the new collage sheets and even foliage from my yard to create the three pieces. 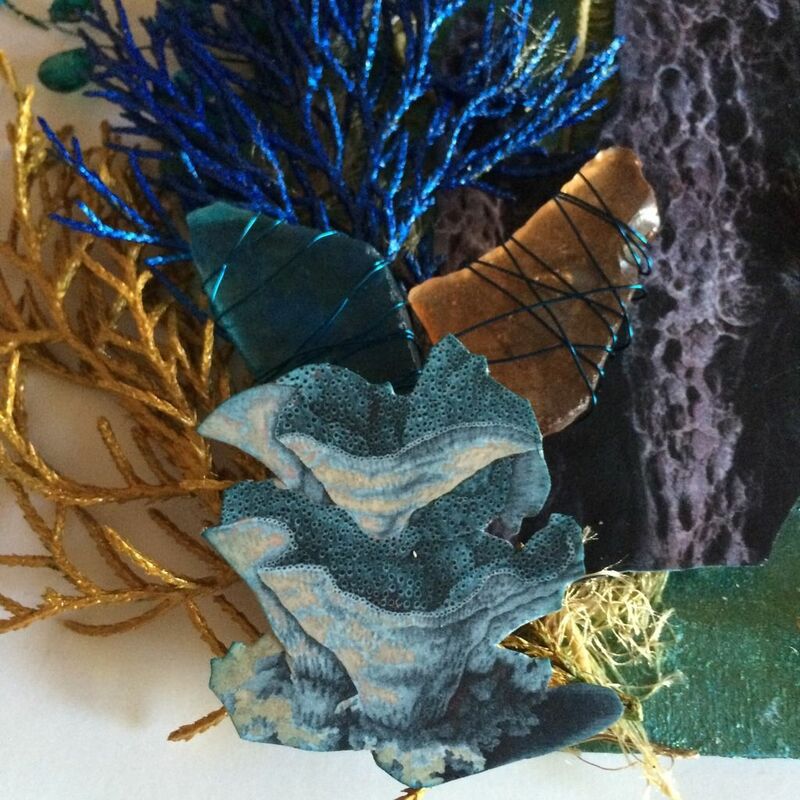 In addition to the new collage sheets, I will also walk you through how I constructed each piece and the materials I used. 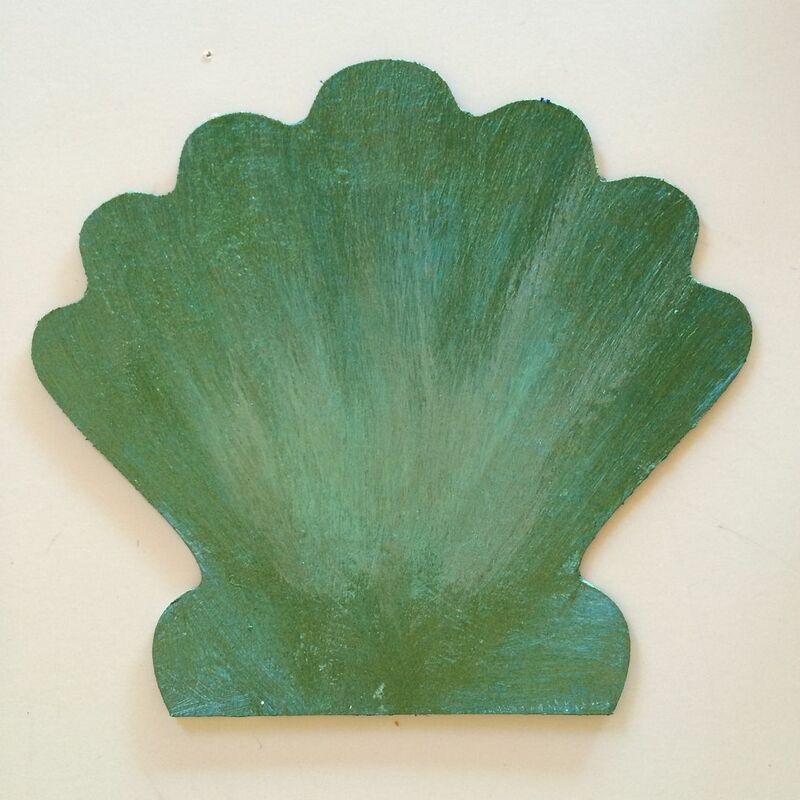 I am giving away all of the art pieces and you'll find the details at the very end of the post. 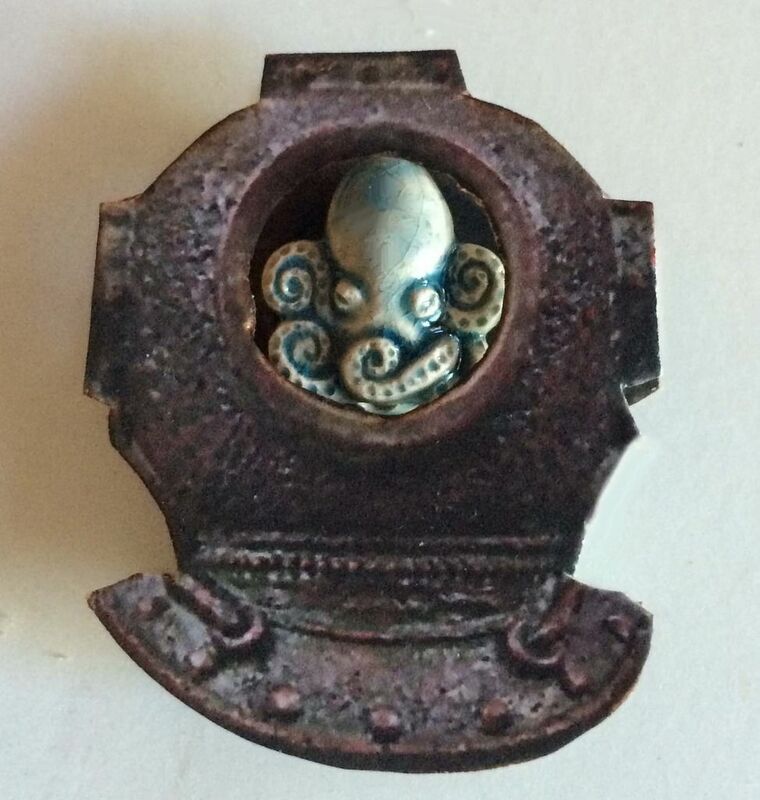 A baby octopus has found a home in an old diver’s helmet. 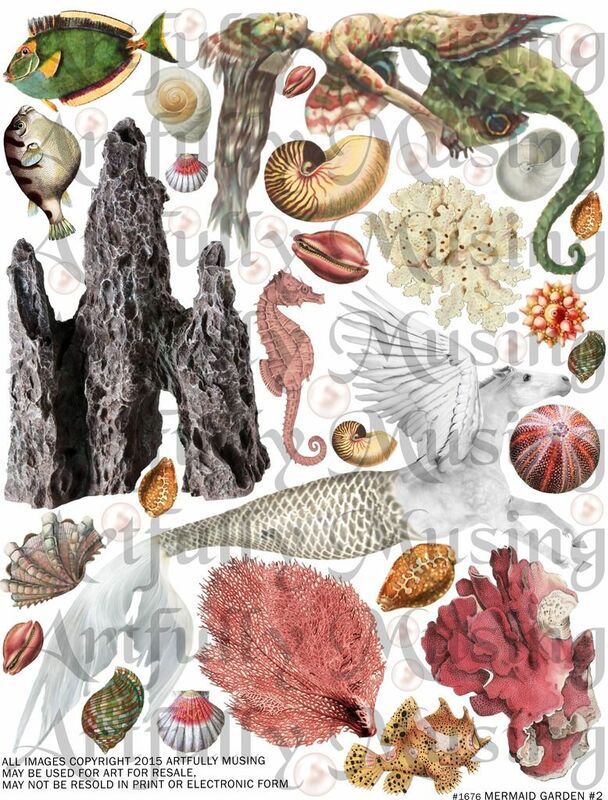 My new series of mermaid collage sheets are packed with mermaids, hippocampi, octopus, fish, shells, coral, ruins of the ancient world and more. 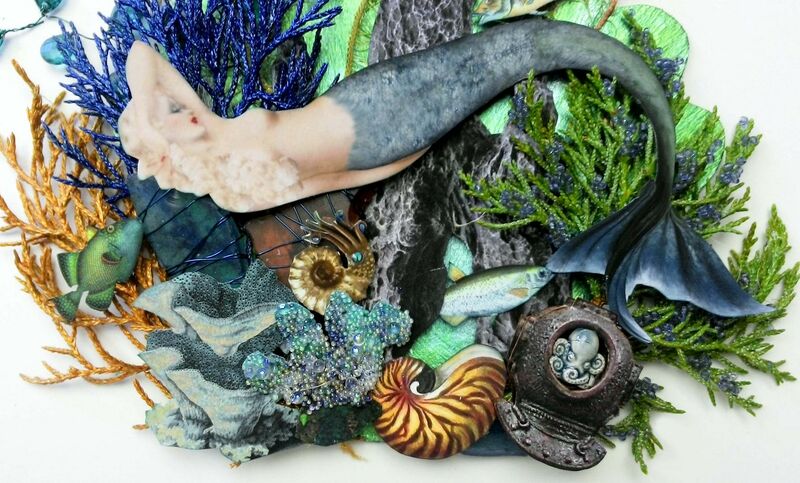 There is everything you need to create your own mermaid garden. 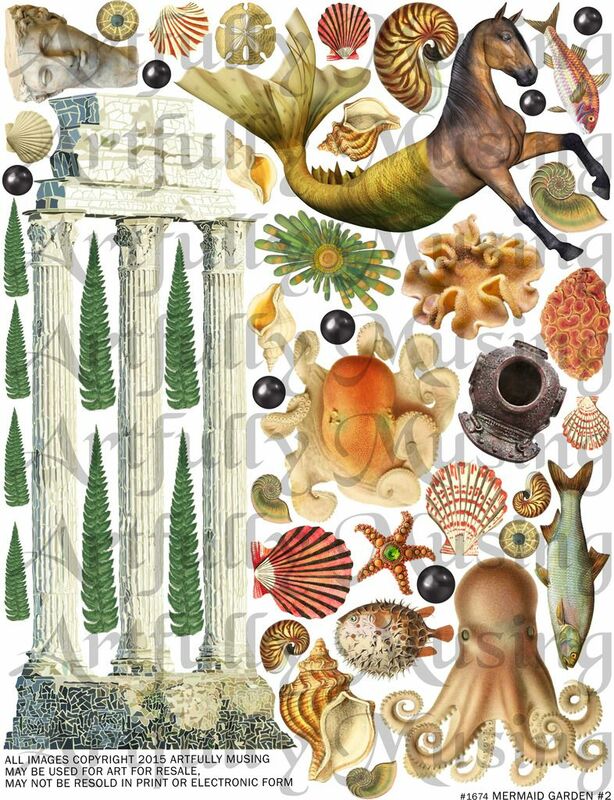 All of the images you see on the three art pieces are from these collage sheets. 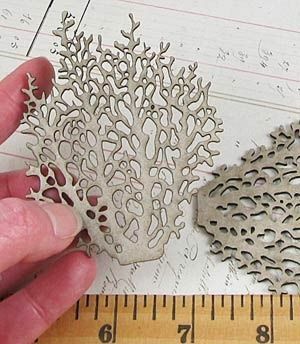 The base of each of the pieces is made from a die-cut chipboard shell. 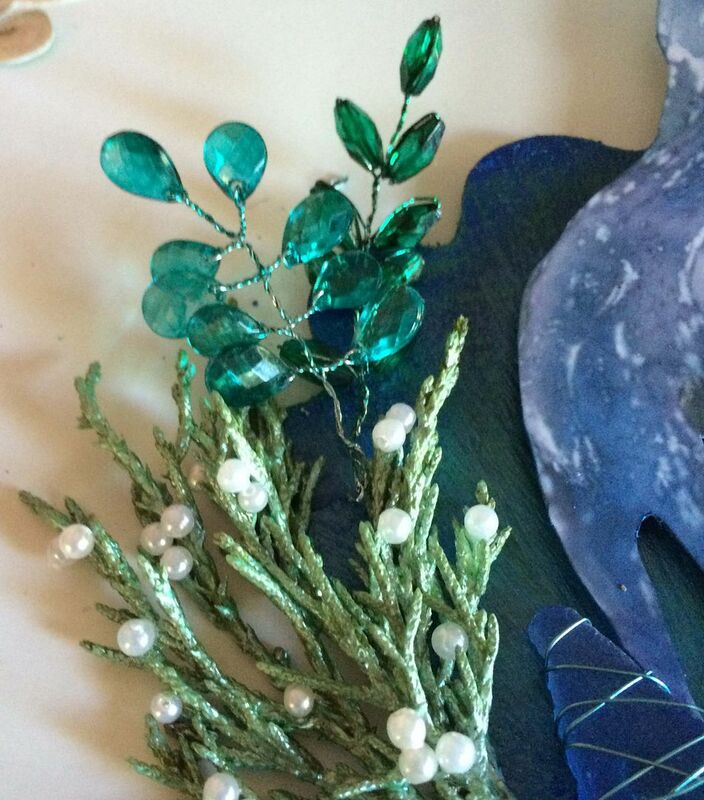 I used various luminescent and iridescent Lumiere and Liquid Pearls paint to color the shells. 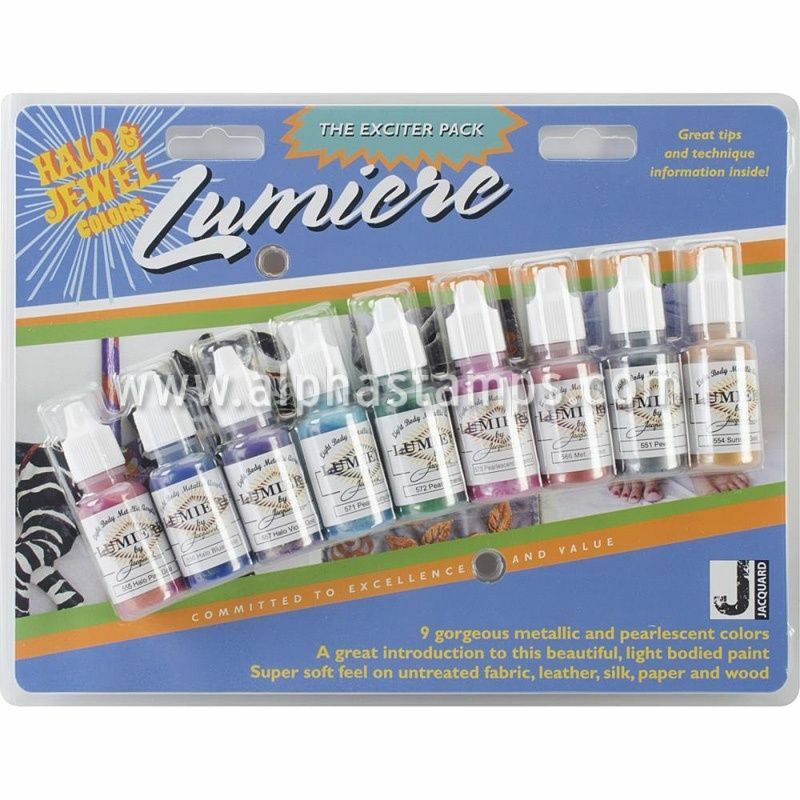 A great way to purchase small quantities of multiple Lumiere colors is through the Exciter Pack which includes some of the colors I used and others that would work well for a mermaid or other jeweled colored theme. 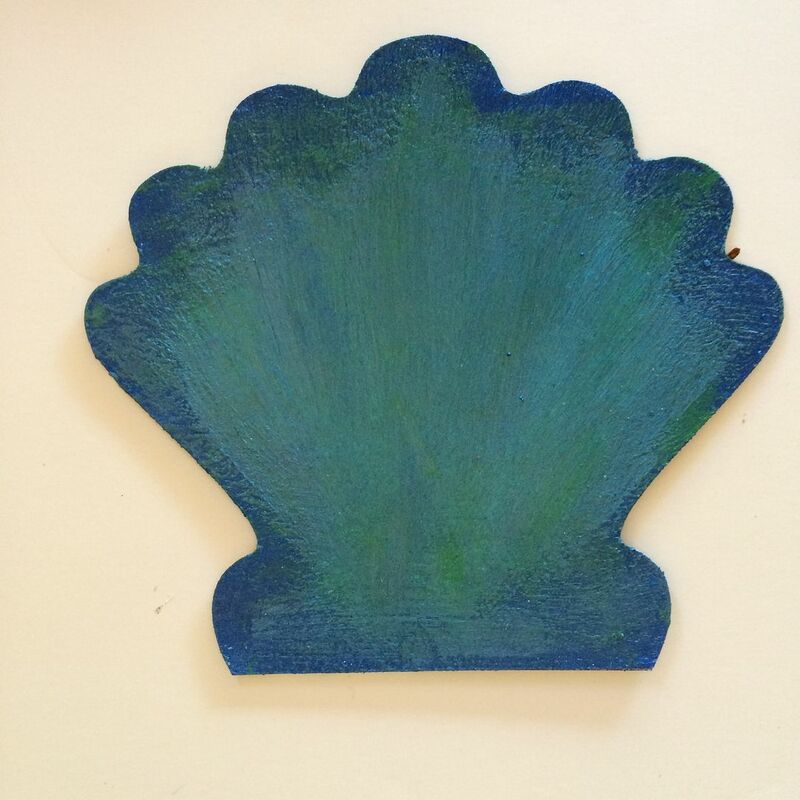 I started by painting the edges with Royal Blue Liquid Pearls and then dry brushing the center of the shell with the same paint. Next, I painted the center of the shell with Pearl Turquoise Lumiere pulling some of the paint into the Royal Blue Liquid Pearls. 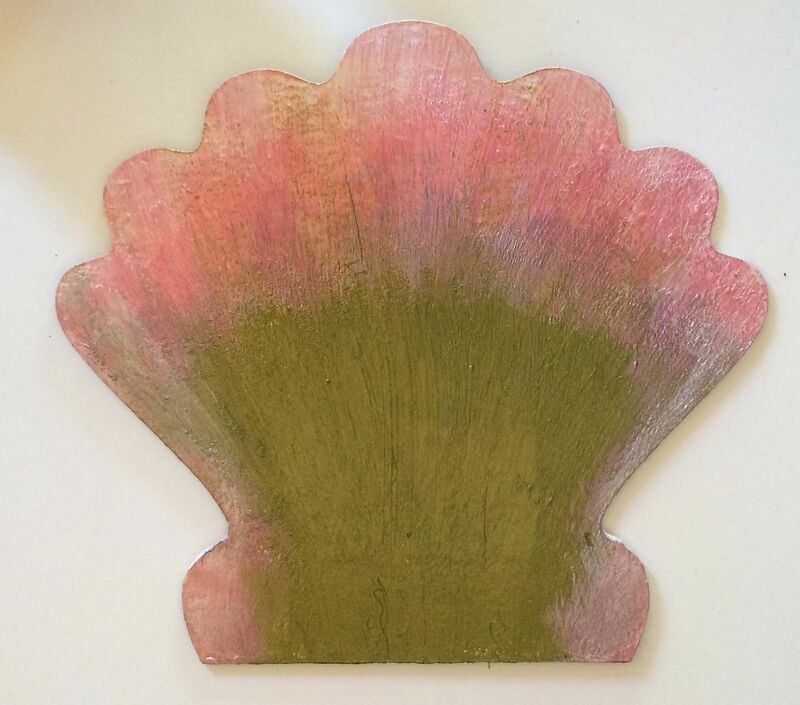 Lastly, I dry brushed Peacock- Liquid Pearls on to the shell. I then glued fibers onto the right side of the shell. 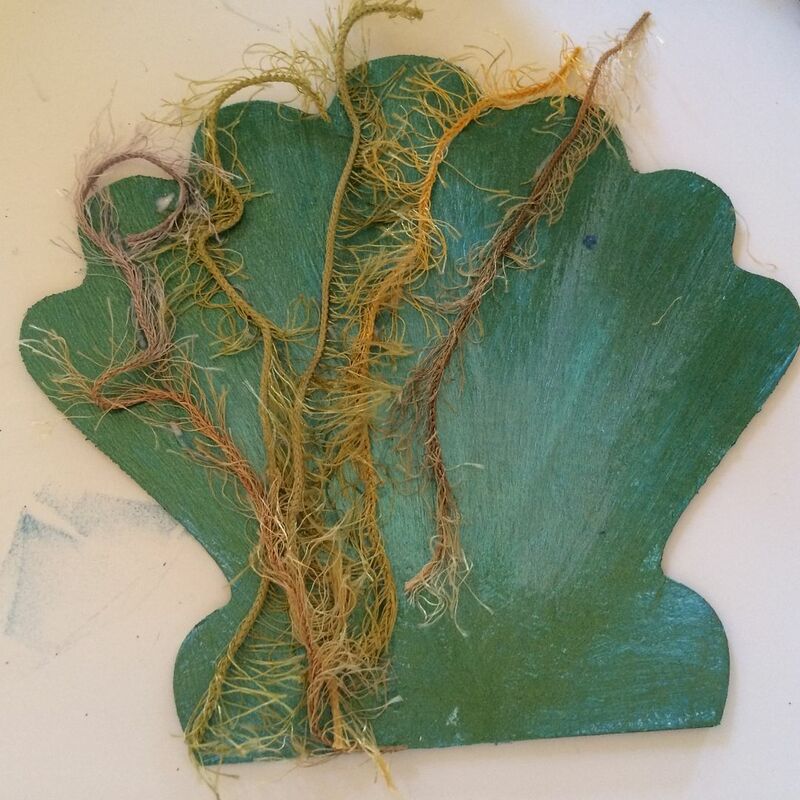 Next, I went foraging in my yard to find something that looked like seaweed. 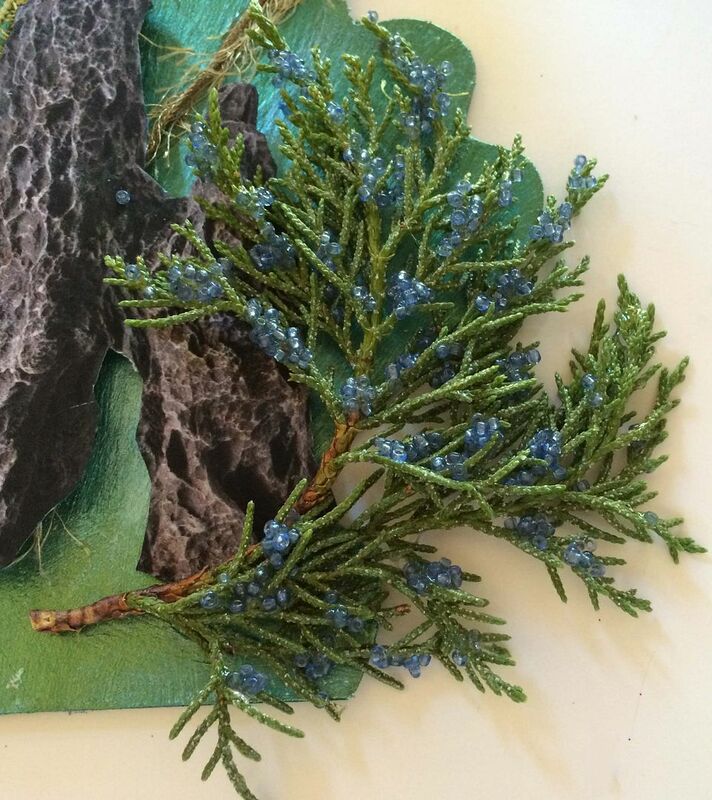 What I ended up using, was foliage from a juniper evergreen tree. 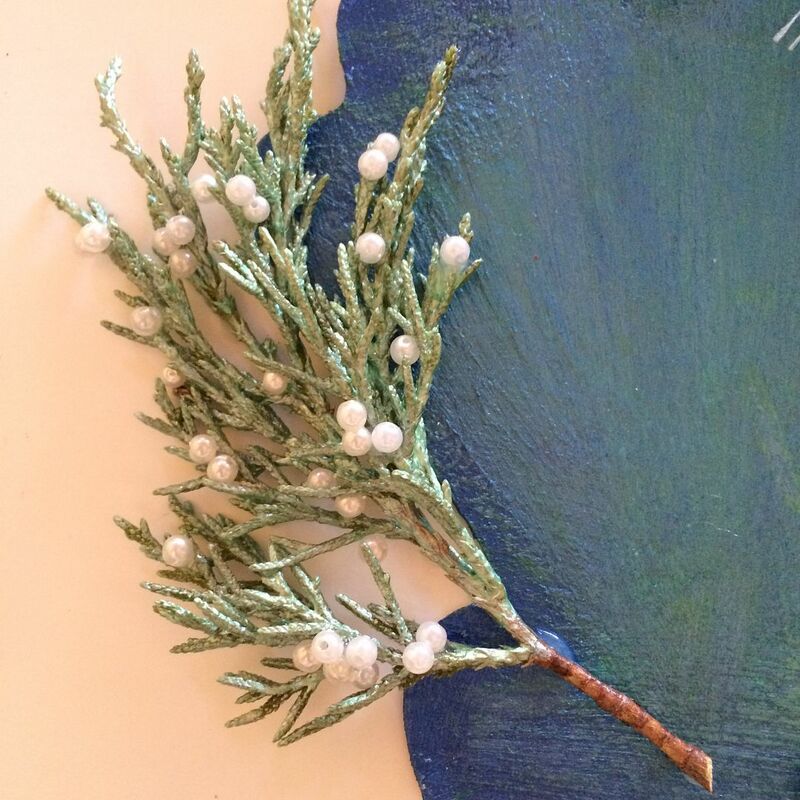 I painted the juniper sprig pictured below with Mint Green Liquid Pearls and glued on pearl beads. 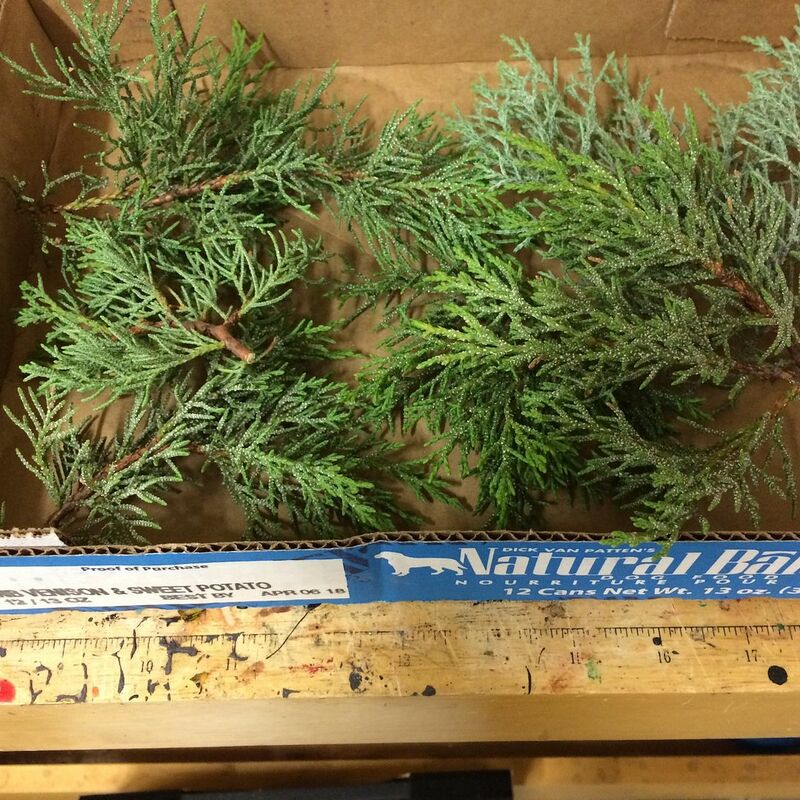 After painting this and the other juniper springs I spray painted them with multiple coats of polyurethane to seal them so they would not fall apart when the greenery dries out. 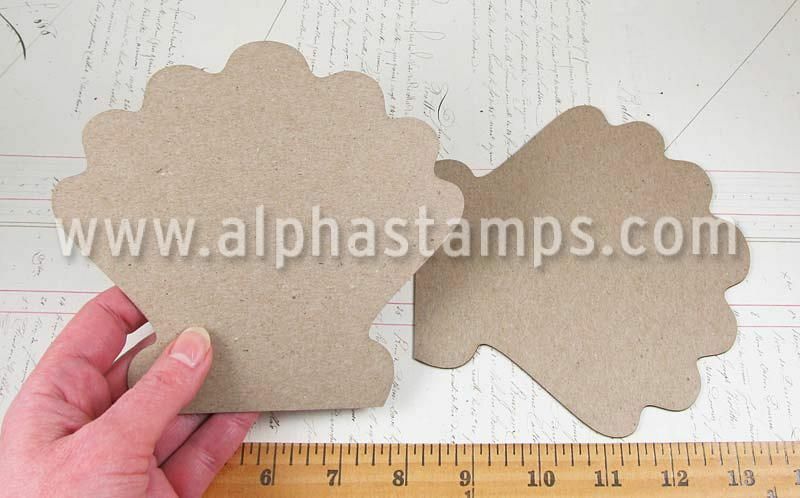 I think probably Modge Podge would act as a good sealer or other products you might have. 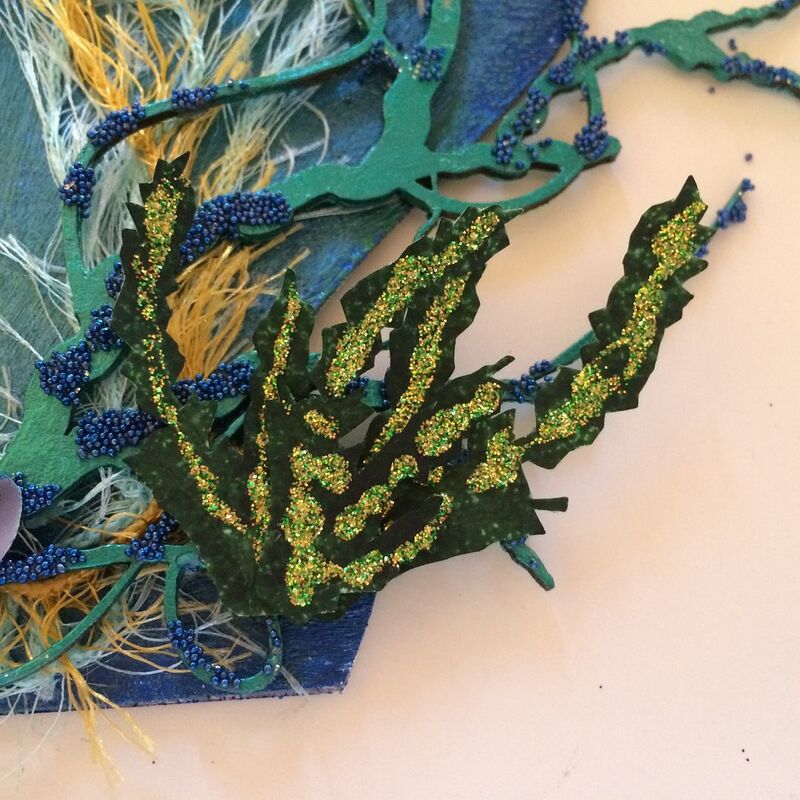 The next addition to the shell, is a piece of seaweed die-cut chipboard which I painted with Ivy Green Liquid Pearls and glued on Royal Blue Micro Beads. 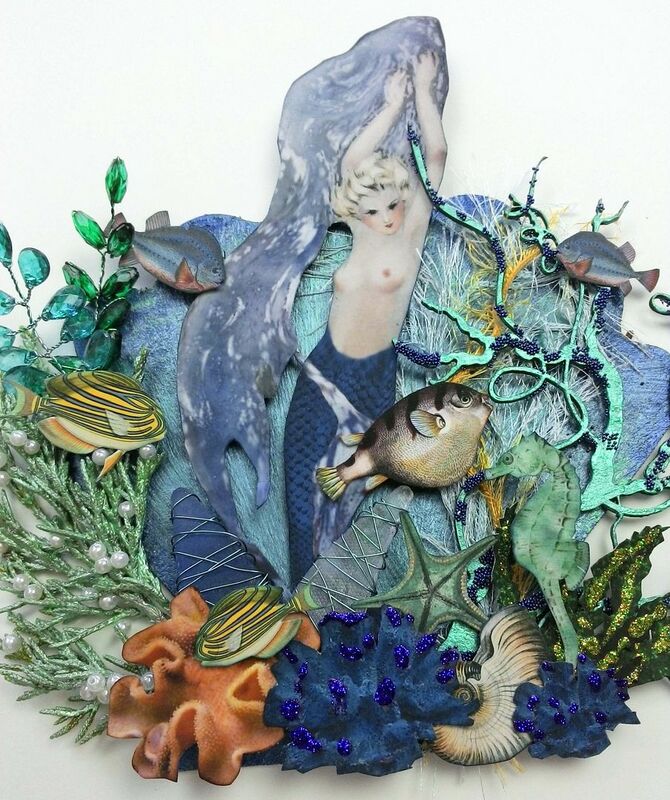 Next, I added the mermaid from the collage sheet to the center of the shell. 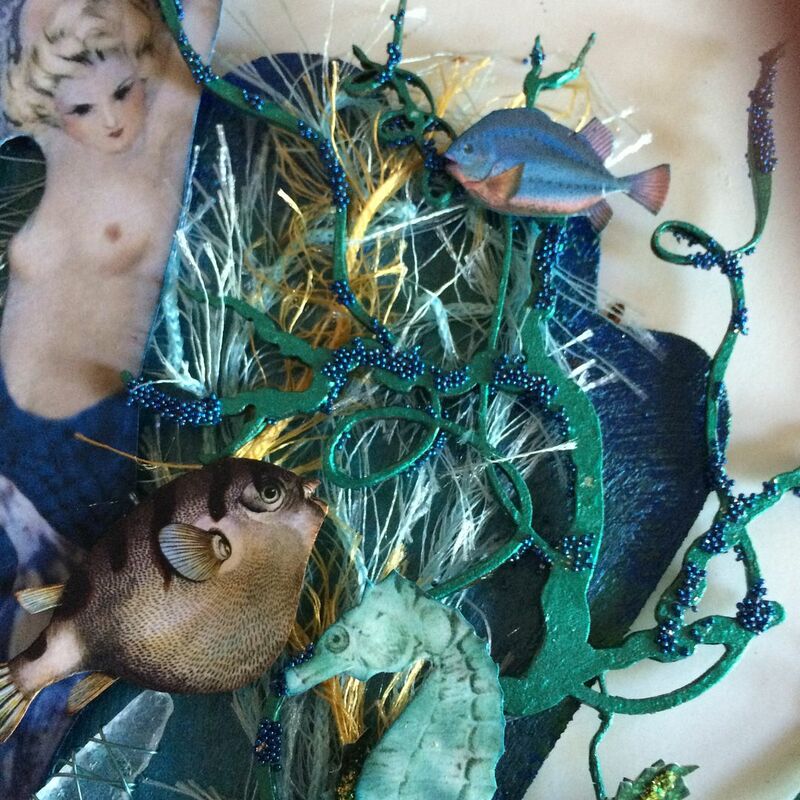 In the right bottom corner, I added some of the green seaweed from the collage sheet accented with Stickles. 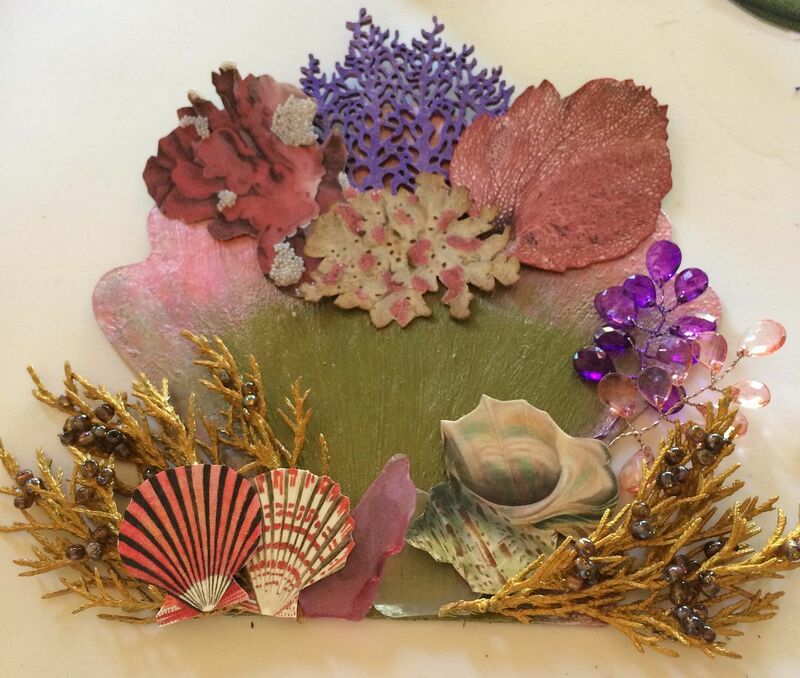 I then added a shell and coral decorated with glitter. 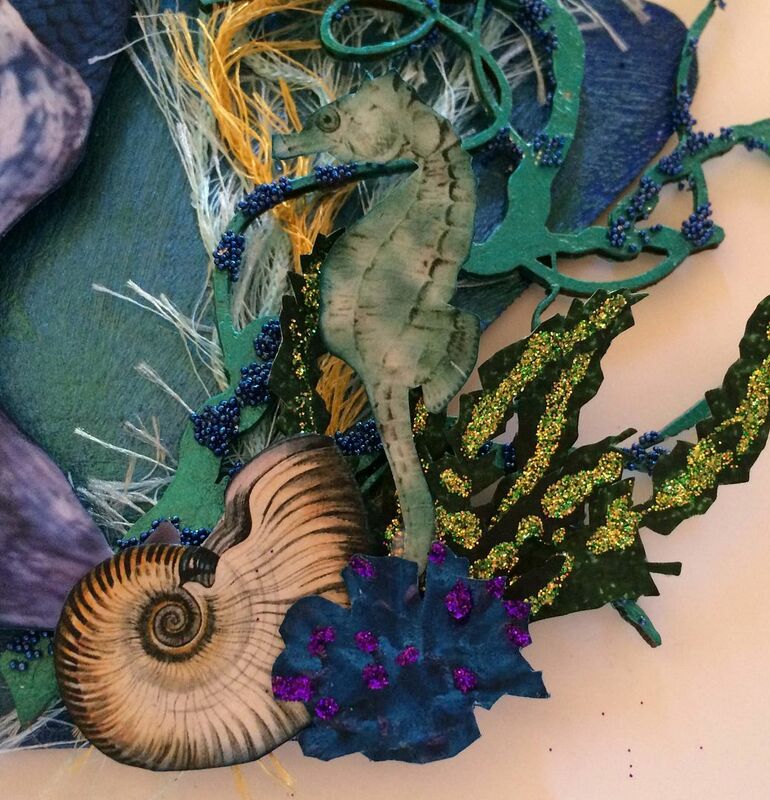 The final touch in the corner is a seahorse. 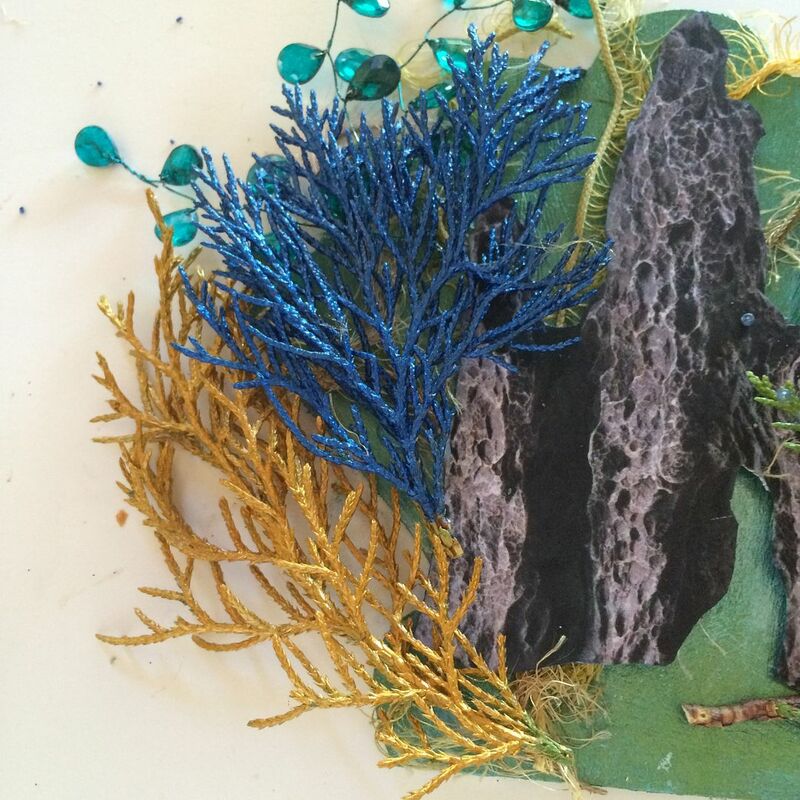 Above on the right, I added two fish to the chipboard seaweed. 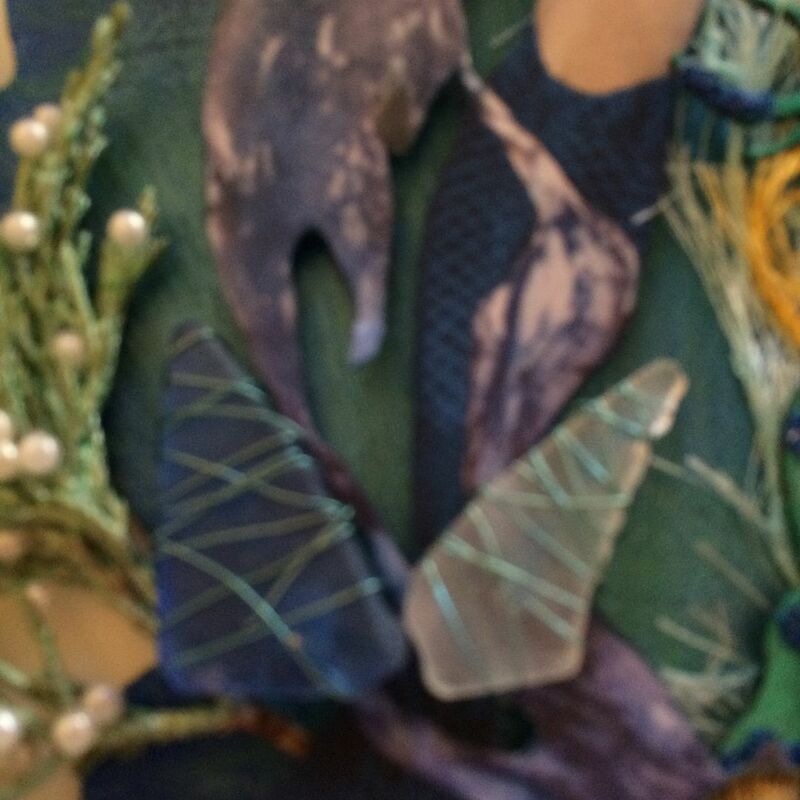 In the center, I wrapped two pieces of sea glass with wire. 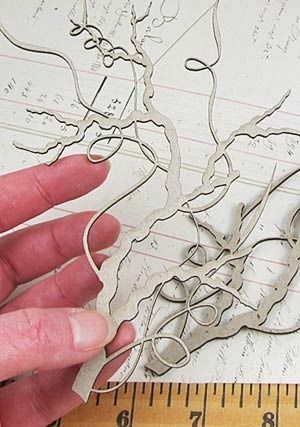 I thought that the wire gave the glass more interest and also looks like markings on a fish or coral. 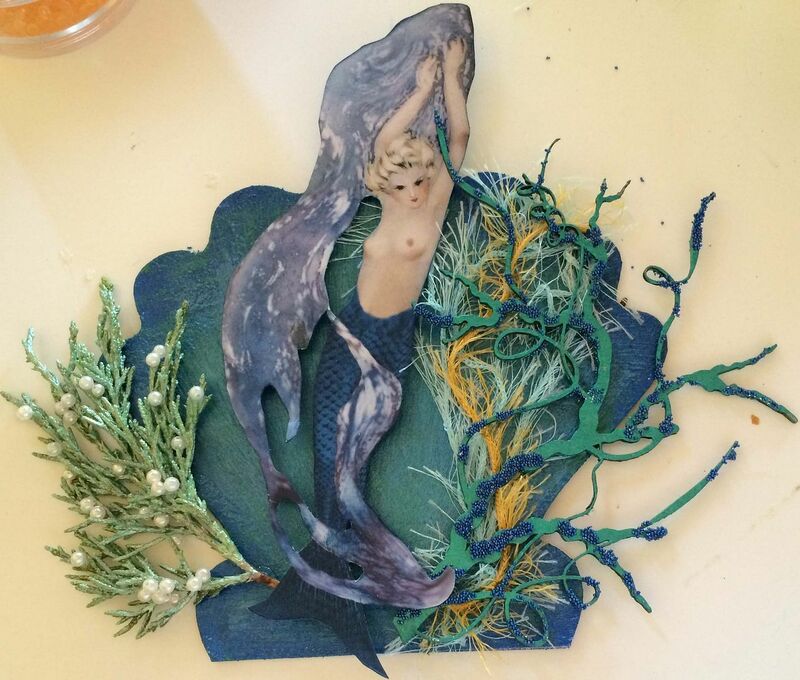 Behind the juniper sprig I added an acrylic bead spray painted with Mermaid Alcohol Ink. 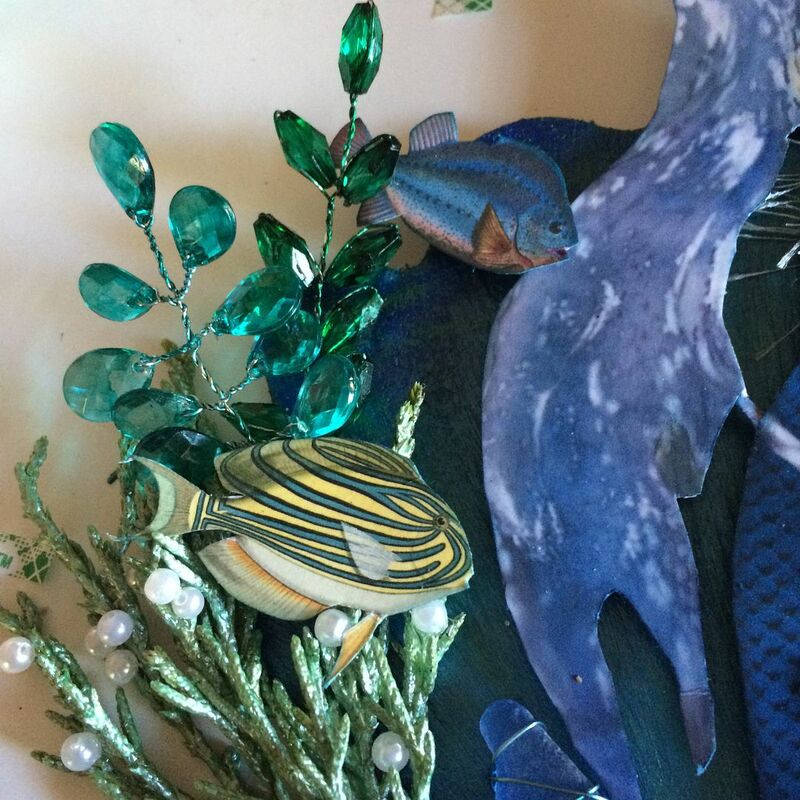 The final touch is two fish from the collage sheets. 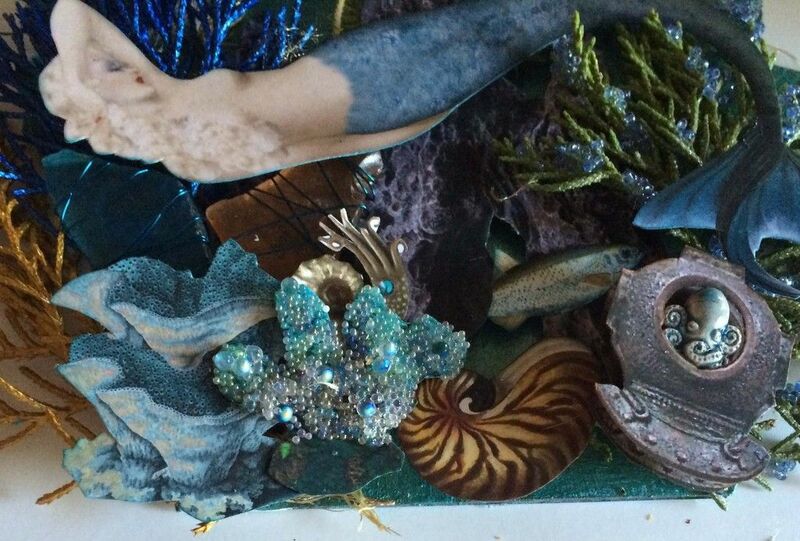 At the bottom I added more coral and a starfish. The piece is now complete. 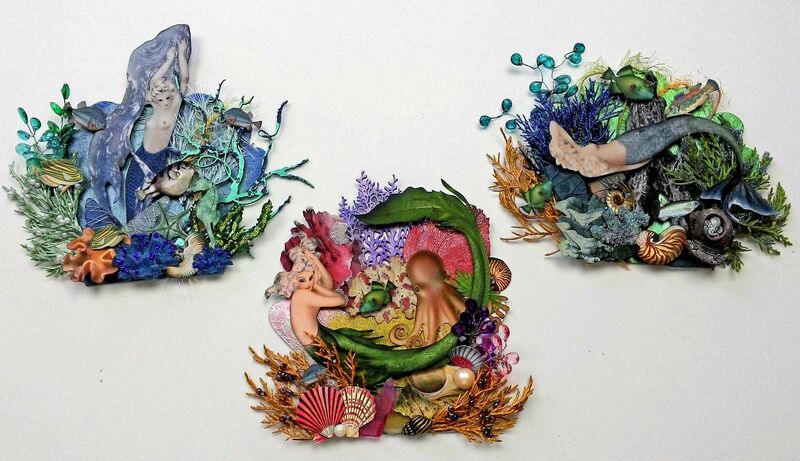 Here we see the mermaid sleeping in her garden. 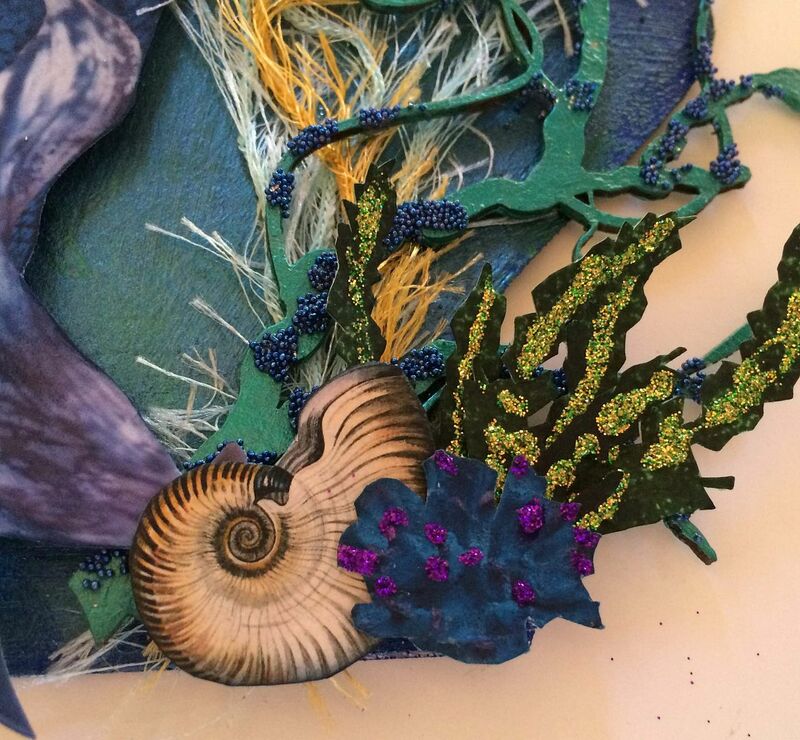 I first painted the shell with Peacock Liquid Pearls and then in the center with Pearl Turquoise Lumiere. I glued fibers on the left side of the shell. 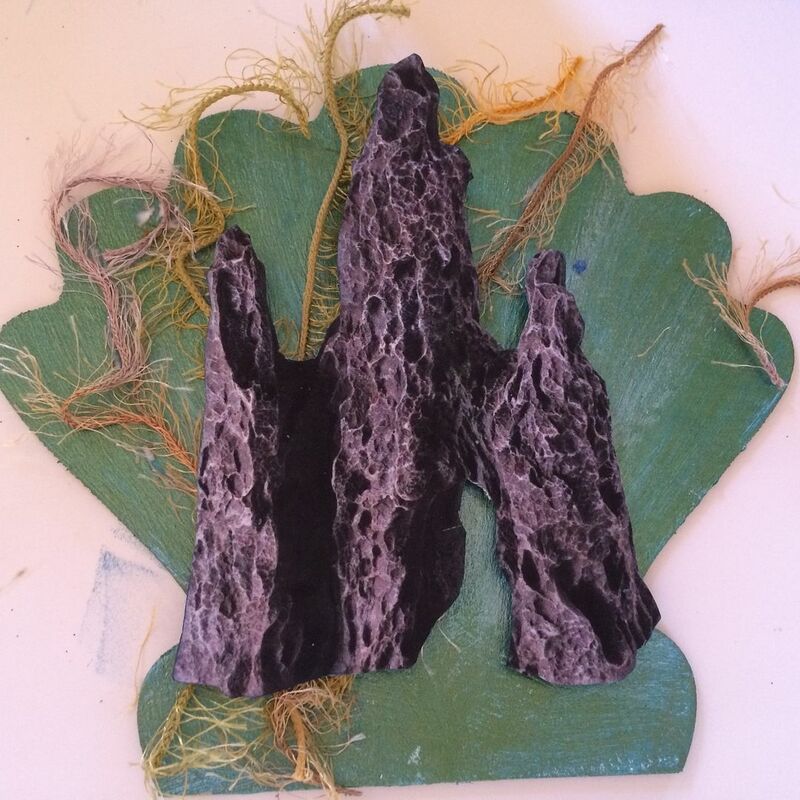 I added the rock image from the collage sheets to the center, popping it up with double stick foam tape. I added an acrylic bead spray painted with Mermaid Alcohol Ink. On the left side, I added a juniper spray painted with Avocado Liquid Pearls and accented with blue beads from the Lavender/Pink Bead Mix. 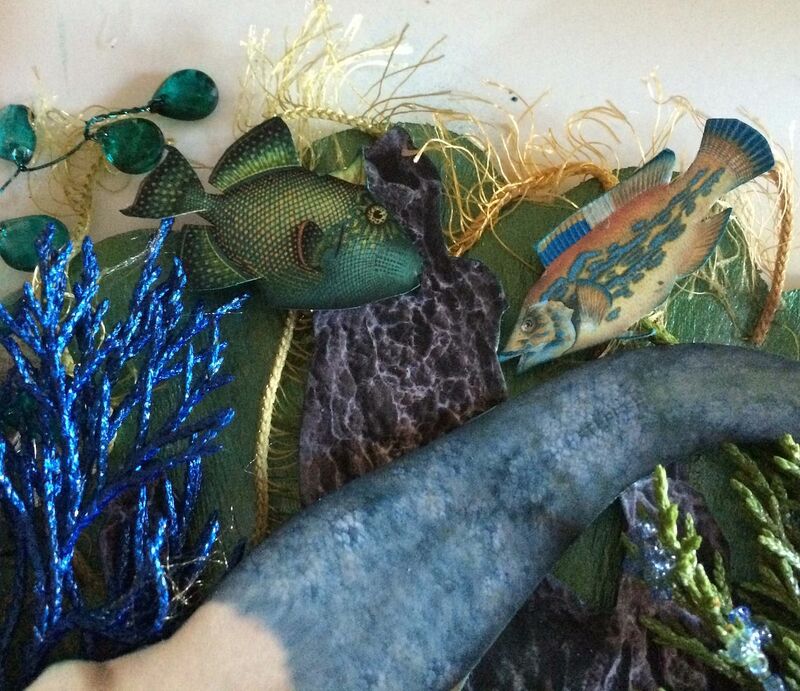 To the right side, I added juniper sprays painted with Sunset Gold Lumiere and Royal Blue Liquid Pearls. 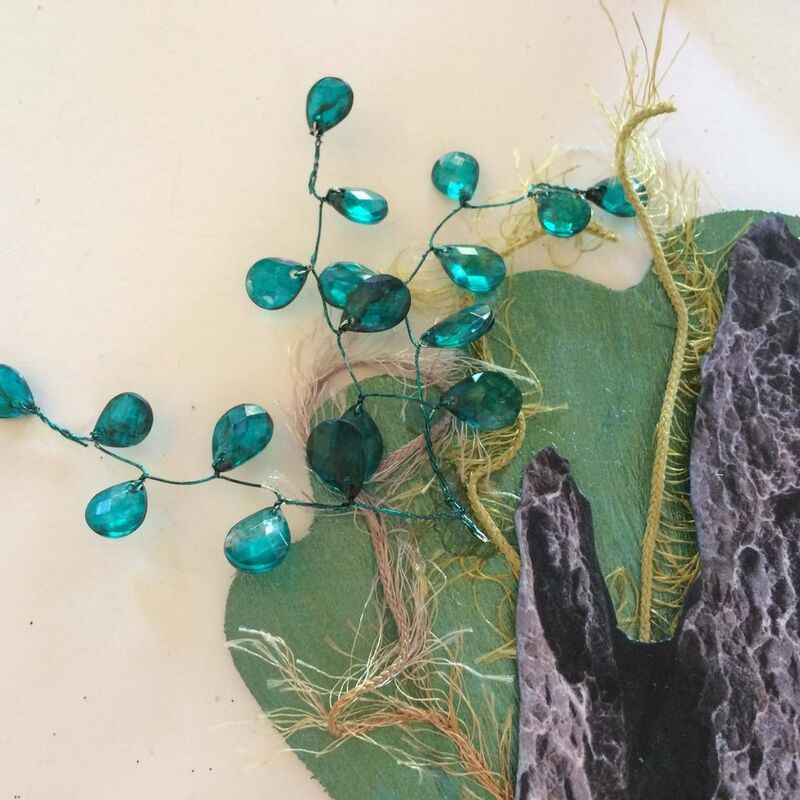 I wrapped pieces of sea glass with wire. 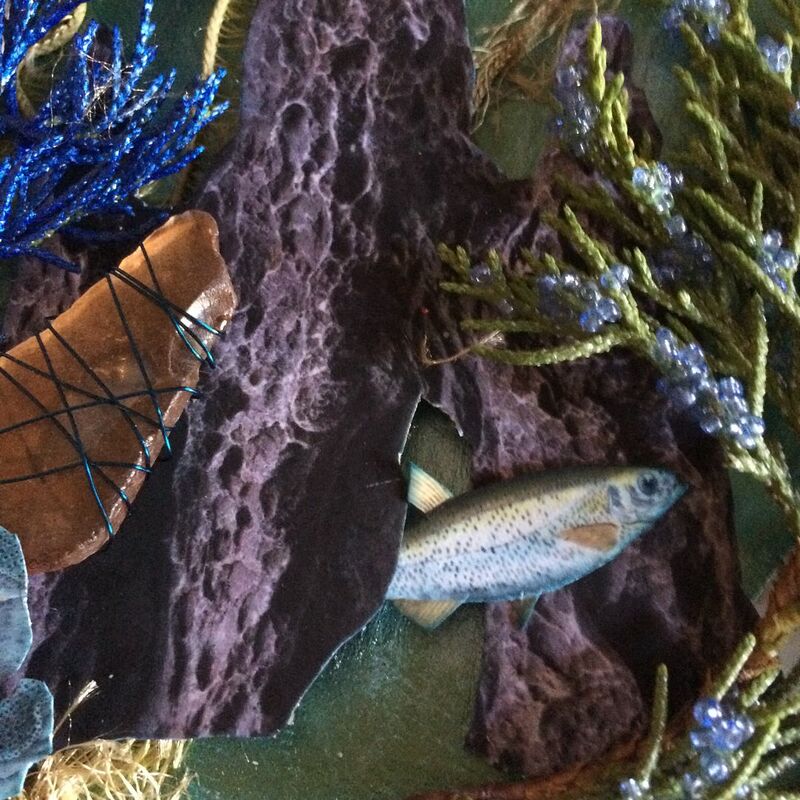 Coming out of the hole in the rock is a fish from the collage sheets. 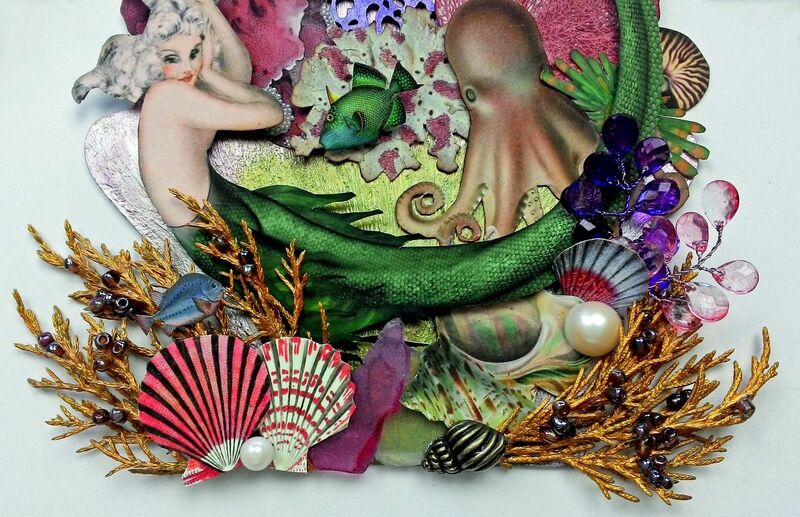 To the bottom, I added coral, a shell, a shrimp and a diver’s helmet with octopus bead. 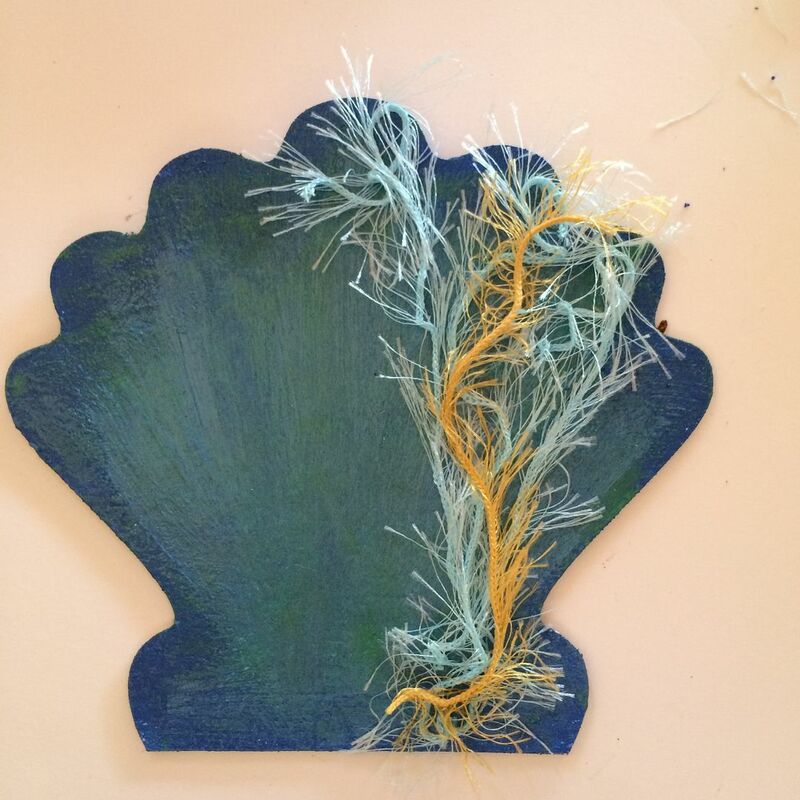 I glued a glass micro bead onto one of the pieces of coral. There are two sizes of beads in the mix. In order to get the octopus bead to fit inside the helmet, I printed the helmet twice, cut out the center of one of the helmets and attached it the other image of the helmet popping it up with double stick foam tape. 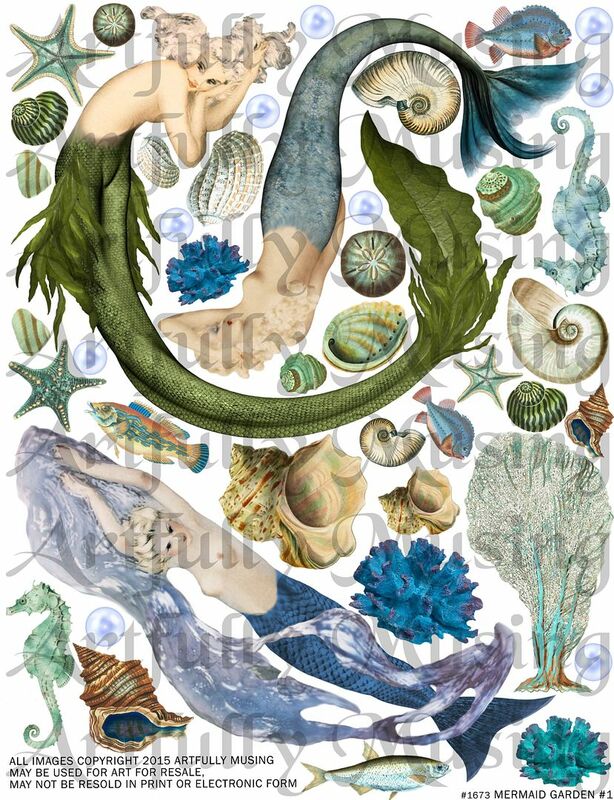 The last item is the mermaid and fish as the top and the left side of the piece. 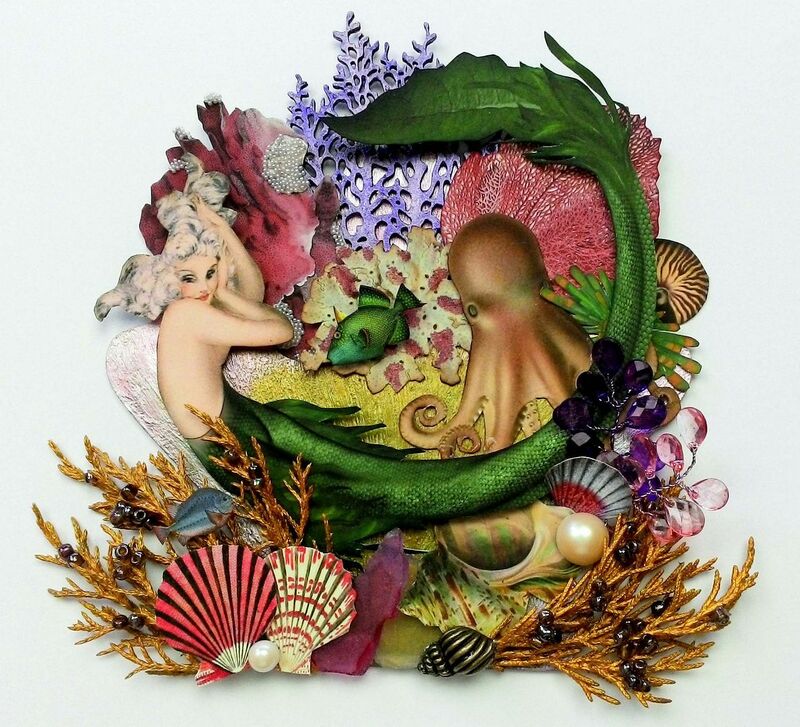 For the pink shell, I started by painting the center with Avocado Liquid Pearls. I then painted the area above the avocado with Flamingo Liquid Pearls. Above the flamingo liquid pearls, I painted the area all the way to the edge with Petal Pink Liquid Pearls. I dry brushed the edges with White Opal Liquid Pearls. 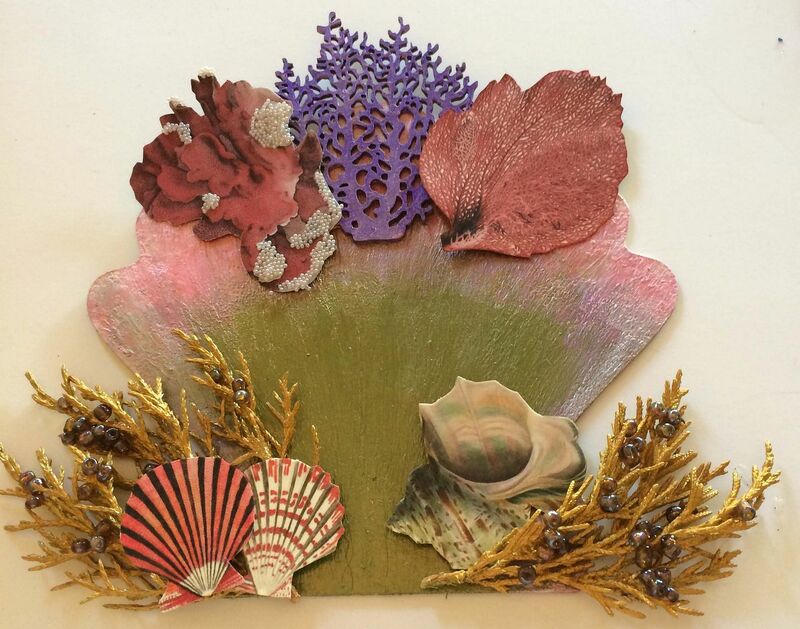 I painted the die-cut chipboard coral first with Pearl Violet Lumiere and then dry brush it with Flamingo Liquid Pearls. 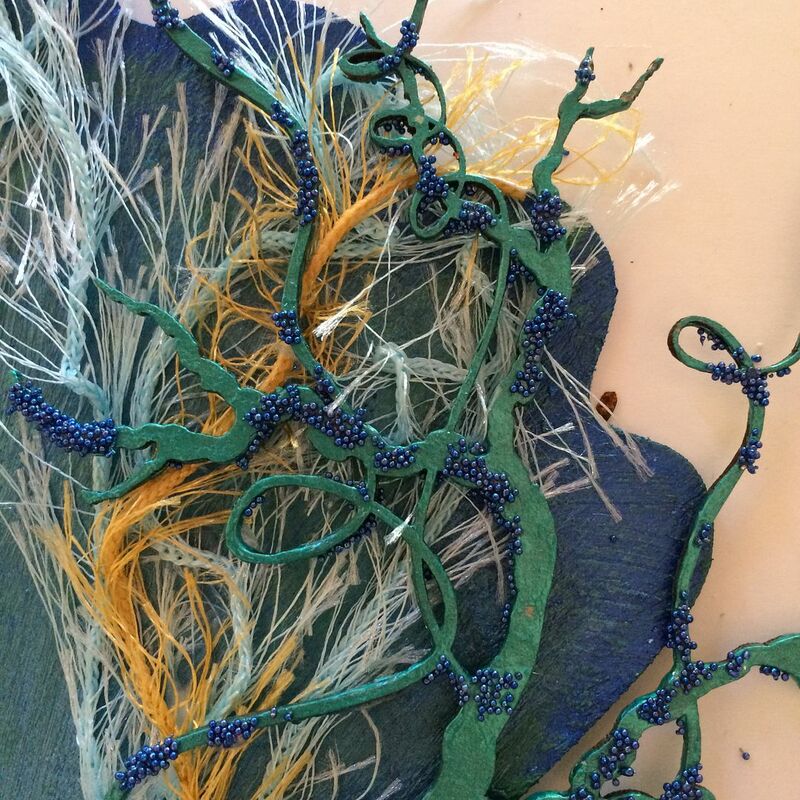 In addition to the chipboard coral at the top of the piece, I added coral and seaweed images from the collage sheets. To the image on the left I added white pearl microbeads. 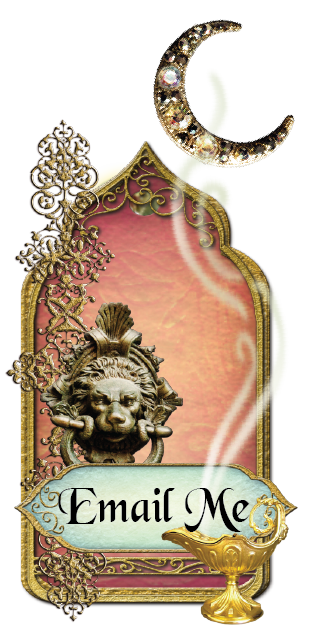 At the bottom I added juniper sprays painted with Sunset Gold Lumiere and accented with lavender beads from the Lavender/Pink Bead Mix. 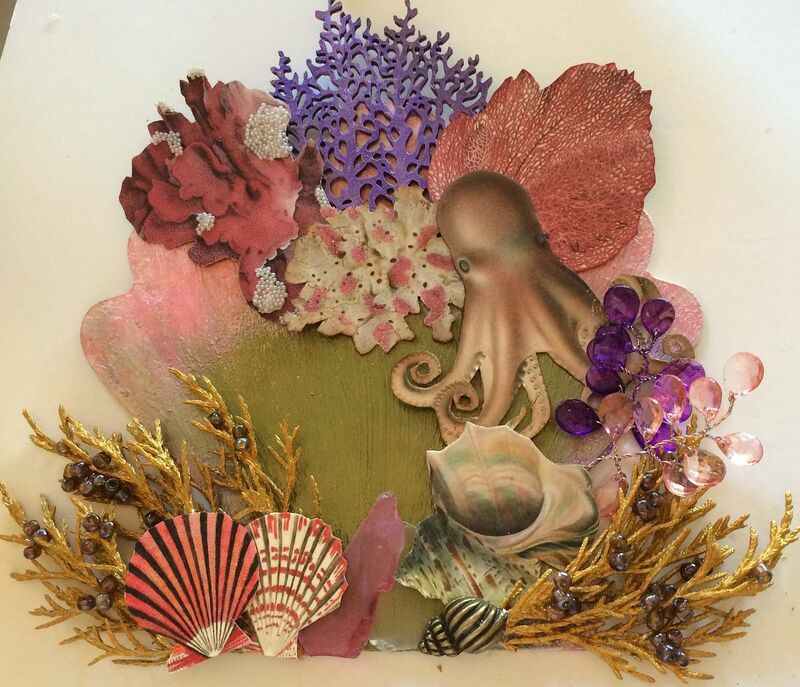 Next, I added shells from the collage sheets to the bottom and white and pink coral to the top ,which is accented with pink microbeads from my stash. 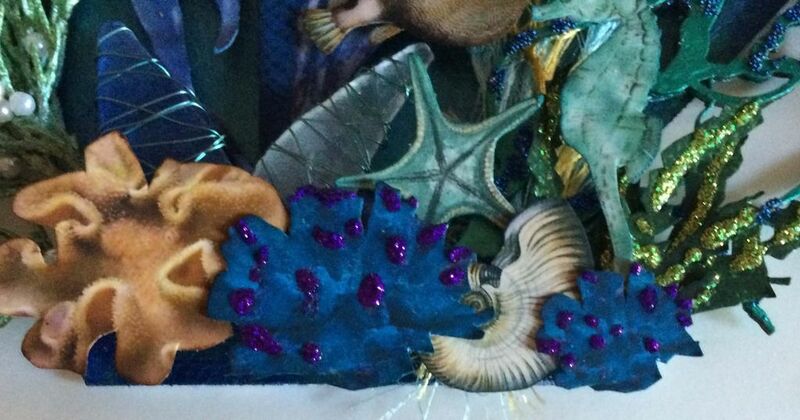 On the right side I added acrylic bead sprays painted with Purple Twilight and Shell Pink Alcohol Inks. 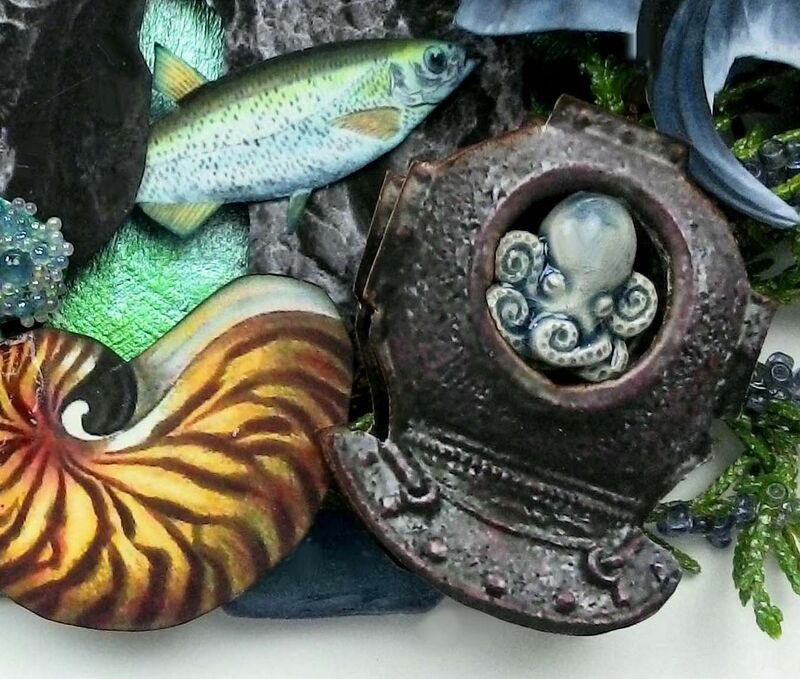 I also added the octopus image. 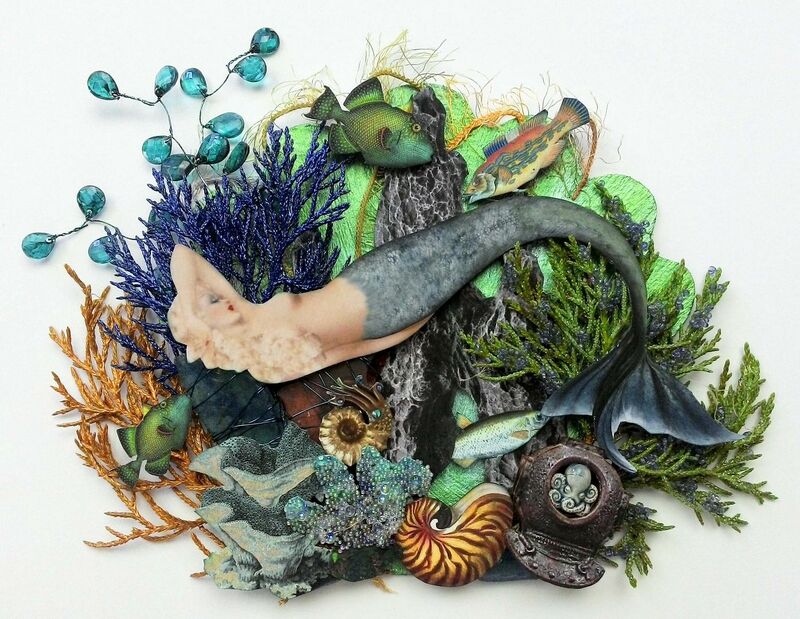 At the bottom, I attached sea glass. 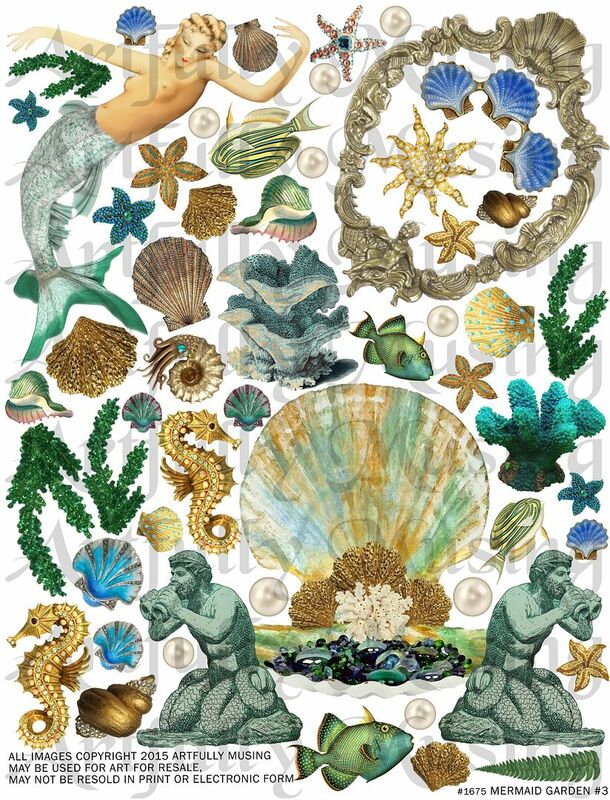 Final touches include the mermaid, a fish, a brass conch and some flat back pearls.